where denotes the generator of and represents the subset of copulas in , that is aggregated for copula for . This structure continues until at level a single copula aggregates all the copulas at its previous level, . 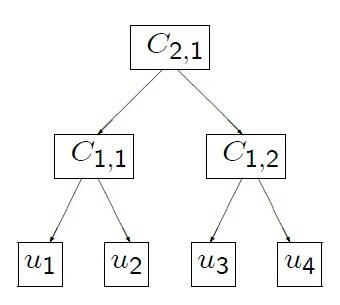 Theorem 4.4 of McNeil (2008) states that the sufficient condition for a general hierarchical Archimedean structure to be a proper copula is that all appearing nodes of the form have completely monotone derivatives. This condition places certain constraints on the copula parameters. In particular, if all the copulas in a hierarchical structure come from the Frank, Clayton, or Gumbel family, then for all j when . Intuitively, this means that rank correlation must be increasing as you move down the hierarchical structure. The hierarchical Archimedean copulas available in the COPULA procedure are the hierarchical versions of the Clayton, Frank, and Gumbel copulas. Start at , and generate a random variable with the distribution function with Laplace transform . For , generate from its parent hierarchy. For , recursively call this algorithm with the proper inner generators that correspond to the copula family. Let be the outer generator and the nested generator, and let and be the respective generator parameters. Let v be a draw from distribution function with Laplace transform . The inner copula generators and their corresponding Laplace transform distributions for the Clayton, Frank, and Gumbel family are summarized in Table 10.3. Note that when , the inner generators for the Clayton and Gumbel family both simplify to the generator of the independence copula, . For more information about simulating from the distribution with the Laplace transform given by the inner generator for the Frank family, see Hofert (2011). For more information about how to simulate from a tilted stable distribution, see McNeil (2008).